Along with Sony and Samsung, Sharp is a leading manufacturer of high quality high definition television (HDTV) products. Sharp’s line of LCD TVs is the best on the market and the company offers the world’s largest LED screen with an 80-inch diagonal. Searching for a specific Sharp TV review? Sharp HDTVs feature state-of-the-art technology that only a few companies can match. In the field of LCD high definition televisions, Sharp is the recognized industry leader. Sharp products score high in terms of reliability with generally sound construction and use of high quality materials. Some customers though complain that the products are a bit difficult to use with less than intuitive controls. Customer service is good overall with excellent responsiveness but about average quality. 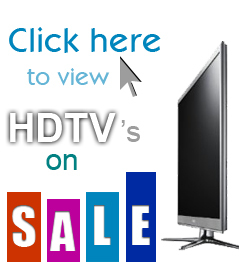 As one of the oldest manufacturers of HDTVs, Sharp products are renowned for their high quality. The company is a leader in high definition LCD technology and it has gained a reputation for always pushing the bounds in delivering excellent products. The AQUOS line of LCD TVs feature industry-leading technology with rich crisp colors and outstanding contrast levels. Sharp LCD TVs have real rather than dynamic contrast ratios of 800:1. This provides for excellent viewing of darkly lit scenes. If power consumption and eco-friendliness is a concern, the AQUOS LED TVs feature high quality displays with a 30 percent reduction in power usage. Sharp LED LCD TVs use the Quattron Quad Pixel Technology that allows exceptionally high quality 1080p resolution displays at reduced power consumption rates when compared to standard LCD models. The four color filter provides realistic rendering of reds, greens, blues and yellows. The innovative panel design provides for better backlighting with deep blacks for optimal contrast. The HDTVs have good connectivity and sharing capabilities using DLNA certified networking and IP Control to link up with the Internet using computers, control panels or mobile devices. Sharp is also a leader in providing the widest screens including its current 80-inch diagonal LCD, which so far is the largest on the market. Sharp products offer competitive pricing when compared to competitors at similar technology levels including Sony and Samsung. Sharp customer service may rank a bit lower than the latter companies though. Sharp customers sometimes complain about having trouble communicating with customer support representatives and about having difficulty in using the product. Sony customers also frequently complain that it is difficult to learn how to operate their HDTVs. In comparison, Samsung products are generally intuitive and easy to use. Sharp offers good entertainment packages with its products including Netflix, Pandora, Blockbuster, Facebook, and AQUOS Advantage Live. Overall, Sharp HDTVs are good values but they still need some work to reach the five star level. Sharp offers highly responsive customer service phone lines with relatively short wait times and fast response on email and other tickets. However, the quality of customer service still lags a bit. Some customers complain about communication problems with customer service representatives. A significant number are not able to get their problems resolved in a satisfactory manner. Therefore, there is still room for improvement when it comes to the company’s customer service department. Most Sharp products feature a one-year parts and labor warranty that starts on the day of purchase. The Sharp website offers a web-based email form along with toll free customer support phone numbers. No live chat service is available. The site also provides software downloads and safety updates. A glossary is available for general terms, but there is no online troubleshooting manual. In total, Sharp is nearly as good as you can get, but not quite. Generally, it is still behind Sony and about even with Samsung. The products have overall good reliability but many customers report having at least some minor problems with the HDTVs right out of the box. However, few report moderate or major problems throughout the product’s expected life span. For those looking specifically for LCD HDTVs, you will not find any better options than Sharp’s offerings. At least in terms of the high quality of the four-color displays, there is no match in realistic colors, contrast ratios and sharpness. The company does need to work on its customer service, which though providing great response times still needs to improve in communication and problem resolution quality. Sharp HDTVs offer outstanding technology with a little work needed on overall reliability to match Sony, and some improvement also needed in customer support. However, if your main concern is high quality LCD rendering of pictures, Sharp HDTVs are among the best and they can deliver brilliant images with less power consumption.